Apprenticeship programs sponsored jointly by labor and management on the local union level, supplies employers with the highly skilled workers, who apply the quality roofing and waterproofing systems that keep Central Indiana’s buildings dry. 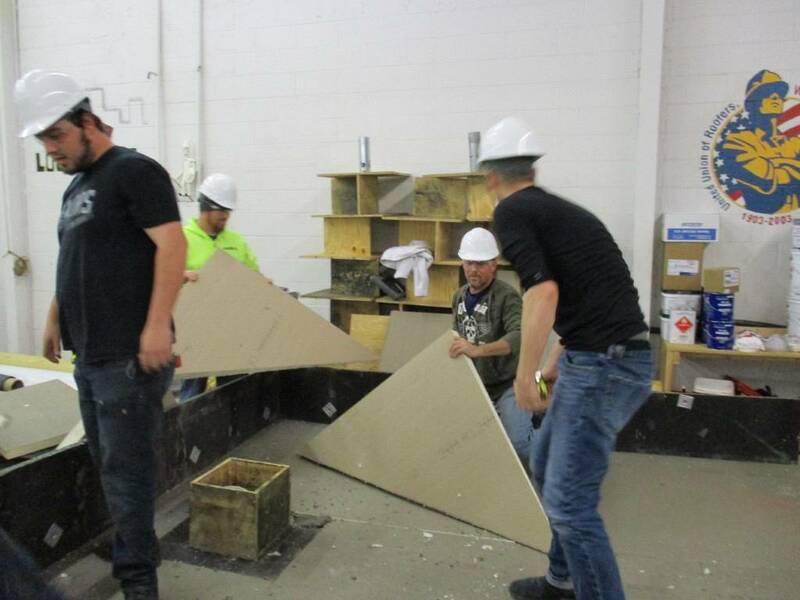 Apprentices learn their craft by training on the job under proper supervision and by studying technical subjects related to the roofing trade at the training center/apprenticeship school. You earn while you learn the trade. . Union Local 119 wages range from $14.27-$25.95 an hour, plus benefits. Fringe benefits can include health and welfare contributions that protect the union roofer and his or her family with medical coverage, pensions for retirement, and annuities. Union Local 119 negotiates earned wages and fringe benefits on behalf of the hired apprentice through collective bargaining with roofing contractors. Union Roofers and Waterproofers work on various types of buildings, protecting those facilities against water intrusion and ultimate damage to the structure and its contents. Roofing in the commercial and industrial sector is generally of the built-up type or the single-ply category. In built-up roofing, layers or plies of felt are set in hot bitumen over insulation boards to form a waterproof membrane. An aggregate may be embedded in a final bitumen coat to protect the membrane from the ultraviolet radiation of the sun and other environmental hazards. Single-ply roofing encompasses all of the newer plastic, thermoplastic polyolefin (TPO), rubbers (EPDM) and other elasto-plastic type membranes that have their seams welded by solvent, hot air, or glued with contact adhesive to form a monolithic waterproofing membrane. These systems may have a stone, rock, or paver block ballast installed over them, or they may partially or totally adhere to the substrate. These systems are also installed over roof insulation boards. A separate category of roofing is the modified bitumen systems. They may be applied with hot bitumen or torched-on with high-intensity propane burners. Another area of roofing is the residential type. It includes composition shingles, slate, tile, and metal roofs. These applications can also be done in the commercial and industrial sector, as well. Waterproofing is a specialty aspect of the roofing trade and is equally important as a roof in protecting a building against moisture intrusion. Waterproofing can be below grade, which is usually applied in foundation work. Waterproofing can also be utilized on plaza decks, parking garage floors and other sections of a building where water or moisture protection is crucial. Materials used in waterproofing are generally of the same type used in roofing, although, there are many specialty application materials that may be specified for this type of work.